The DEWALT DCS331B Cordless Jigsaw is our top choice. The model is high-quality that includes a built-in dust blower, which is an excellent feature if you will be working on numerous projects since it drives the dust particles away from the user. The manufacturer is a reputable one, and they put a lot of effort into the model’s construction. It’s created from durable steel and has a long lifespan. I love that the product has a keyless blade that can be replaced without the use of any tools. You do need to be careful when it comes to choosing the right blade for the job, though, but the same can be said with all jigsaws. What I like most about this product is that it has a variable range of speed of 3000 SPM maximum. But it doesn’t come with a charger or battery, and that’s quite irritating to customers, even though it the product fairly affordable. From its metal lever action to its keyless blad, and separately sold a battery with charger, it’s no surprise that the DEWALT DCS331B Cordless Jigsaw is #1 on our list. 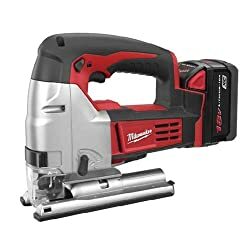 The Milwaukee 2645-20 18-Volt M18 Jig Saw comes with a battery and thus lands at a higher point when compared to other similar models – second on our list. The model’s 18-V battery claims to have a recharge time of less than one hour. Also, the package comes with an extra battery, so you can spend more time working and less on charging. I believe the product manufacturer when claims that the unit can cut through plywood, drywall, plastic laminate, oriented strand board, sheet metal, and other materials. Due to its ruggedness, it’s quite heavier than other similar units. But its ergonomic, molded handle helps is giving you a firm grip on the tool. It perfectly suits ground applications, and the saw’s weight decreases vibration while using it. On the other hand, it is similar to corded material when it comes to weight, which users consider being a disadvantage. Blade changing and tool-free bevel changing allows you to finish your job fast because you are not seeking a tool to change. Its Quik-Lok blade clamp features keyless blade changing, which is a trademark of the line of jigsaws by the Milwaukee brand. The batteries include a power gauge that indicates how much runtime remains, so you do not need to estimate when it is time to charge. Also, Milwaukee makes use of a Digital Power Management technology that prolongs the battery’s life. Its lack of LED guide indicates that you will require an auxiliary light source; however, this all-inclusive package also covers the jigsaw unit, a charger, two batteries, as well as a case to haul it to your job site. It also has a five-year warranty so you can contact the manufacturer with whatever you need. We absolutely love the Milwaukee 2645-22 M18 Jigsaw, especially for horizontal use. Also, it includes a battery, even saving you another purchase. The Ryobi One + P523 Cordless Jigsaw comes in third because not all of its standard blades fit and the blade changing process is quite long. But it does have several nice features for a fair price. It includes four various orbital setting, which allows you to control its wood cutting speed. If you wish to have higher accuracy, then you can lower the device’s setting. The model features graphics that demonstrate which settings you should use. One of the best things I love about this tool is that it has a dust blower built into it, which allows you to work in less dusty space and allowing for a clear-cutting surface. It also features LED lighting, so your projects are constantly well-lit. And maybe its most useful feature is you can lower its foot as the blade begins to wear, meaning you can get a longer lifespan out of the blades and produce less waste too. The system is set into place easily with just a press of a button. The Ryobi P523 jigsaw is among the toughest cordless jigsaws in this lineup. Whether you’re cutting curves though plywood, tearing across lumber, or slicing sheet metal, this jigsaw is quite useful. 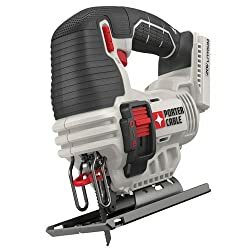 The Porter Cable PCC650B Jigsaw is perhaps the most competitive because of its price point, the Porter Cable PCC650B 20-V Jigsaw is a tool without the batteries included, yet very rich in features. The product requires a 20-V lithium-ion battery but, overall, comes in at 4.5 lbs. Its two main advantages are a long battery life as well as a variable speed. My favorite feature is the tool-free adjustment which allows you to change the blades easily, and its 45-degree bevel adjustment results in precise cuts. The manufacturer recommends that you can easily cut sink cutouts, wood, PVC pipe, metal, and even copper pipe with the Porter Cable PCC650B Jigsaw. It features a 20-volt power, lightweight design at 4.5 lbs. only, as well as numerous other capabilities, given its reasonable price. Regardless of its low cost, Porter Cable offers a three-year warranty, but its construction appears to be durable. Fast and smooth cutting with no aggressive feedback aids with complex tasks for beginners and experts. Its built-in dust blower keeps the cutting line very clean, and its orbital settings enable you to customize depending on your task. Though this model makes use of T-shank blades, it comes with just one, which means you may have to put more blades before utilizing the unit. This Porter Cable Jigsaw is, so far, is our top pick for the best cheap cordless jigsaw. The Makita XVJ03Z Lithium-Ion Jig Saw comes in fifth in this list. 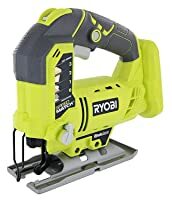 Although it can be compared with top models such as the DEWALT, it does not provide quite as much speed control and only has three orbit settings. With that said, it’s still a decent jigsaw model. It’s built solidly and feels durable and powerful – which is always a plus factor to me. This isn’t a machine that fails after a few months of usage. Also, its blade change system is tool-less, and you can control the speed using a two-finger switch, which, in turn, provides greater control and an especially important safety feature. The machine also provides decent results – clean and precise cuts which can be done fast. We recommended getting an extra battery as well as keeping both charged if you wish to use the device for bigger projects. Its battery life will largely depend on the material you cut but plan in advance if you wish to work at high speed. Like its previous model, this model does not include a charger or battery. Extra features such as lower noise, less vibration, and more control make it a comfortable tool to use. 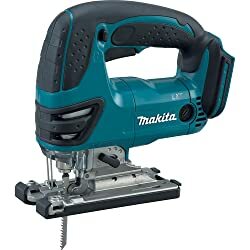 The Makita 18V Cordless Jig Saw combines power and precision at a fairly lowest weight among the models. The power of a jigsaw is measured in amps and relates both to the size and type of motor on the model, together with the size of the battery that it comes with. Also, power is what enables you to make various cuts through various materials. The jigsaws in this review have good power, which measures to round 3 to 4 amps. Often, higher priced models have more power, which ranges approximately 5 to 6 amps. Numerous models feature a variable speed trigger since you will always want to run one speed - depending on your project. Slower ones mean more control on finer projects, but occasionally you will want to hasten if you’re in a hurry. Variable speeds are ideal for many cases. For starters, when you cut thick and hard materials, you will want to choose high speed. However, when entering a cut from within the wood, commencing slowly will ensure a higher accuracy level. Speed settings that are more variable are generally better. All jigsaws in this review have approximately 3 to 5 variable speeds. Beyond variable speed, orbital-action jigsaws provide further control over your cutting experience. Jigsaws that have orbital-action allow the blade to move circularly as it severs the material. Also, you can adjust its orbital action according to the material you’re utilizing. This enables you to cut material with speed and clean excess wood chips as well as sawdust easily. When you notice several orbital settings, this provides you with the control to change between a straight cut to an orbital one. Higher-end jigsaws often feature a dust-dispersal mechanism. Whether a dust collector or a blower, this function aids you to keep your view clean and clear and stop the build-up of sawdust and other material. Still, it is not a required function unless you’re working under very precise conditions. Jigsaws with bevel capabilities allow you to alter the cut angle the jigsaw makes. Therefore, rather than only being able to cut at 90 degrees, you can cut at many other angles, often 45 degrees. A bevel function is quite handy on a jigsaw; it is another advantage aside from the common features. Various bevel angles indicate that you can alter your cuts and include aesthetic touches to a craft. 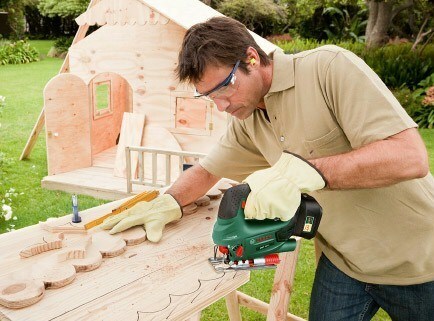 Another feature to consider is the battery life in the cordless and corded jigsaw. If you wish to use your jigsaw for longer periods like on the work site, then you will need a model with long battery life. Comfort is a very important factor when you are using a tool every day. Weight influences how handy your jigsaw is, yet cushioned grips can affect the experience as well. Comfortable non-slip grip guarantees that you cannot only use the jigsaw properly but safely too. DEWALT DCS331B Cordless Jigsaw is our top choice and surely one of the best jigsaws in the market. It is ideal for artisans and woodworkers who are serious about doing a good job. The DEWALT DCS331B Cordless Jigsaw, which runs on a lithium-ion battery, includes a switch for variable speed control that takes it up to a range of speed of 3000 SPM maximum. 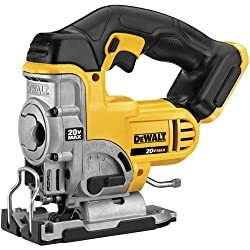 Also, the DEWALT DCS331B Cordless Jigsaw provides you with the choice to choose between four orbital-action settings, allowing you to toggle between the more forceful elliptical action and the delicate linear cuts. Regardless of its lower price tag, the Porter Cable has fared as the best cordless jigsaw for artisans on the budget, which is a decent, cordless jigsaw for its price. The PCC550B includes a dust blower that keeps its cutting line clean throughout the heavy operation. Moreover, the machine has a tool-free and simple, blade removal as well as a replacement system. We hope you learned from this post. If you have, we would appreciate it if you can share this post with your friends. Good luck with your woodworking project!